Make an appointment to get an overview of the preschool program, a tour of our classrooms, and an enrollment packet. Contact Julie Zielke at julie.zielke@aurorachristian.org or 630-892-1551 to set up an appointment. Come with questions... we want to get to know you! Complete the Student Information Form and the Enrollment Contract Bundle which includes the medical release, parent cooperation form and tuition contract. Submit $100 non-refundable deposit (applied toward student fees) to the Preschool office to complete enrollment. Notification of acceptance will be given at the time of enrollment. Sign up on FACTS. This will give you access to your child's financial account. Instructions are included in your enrollment packet and can also be picked up in the office. Submit the Illinois Department of Public Health physical examination form to the Preschool office by the first day of school. Tuition payments are paid directly in FACTS and are due according to the payment schedule you choose in FACTS. 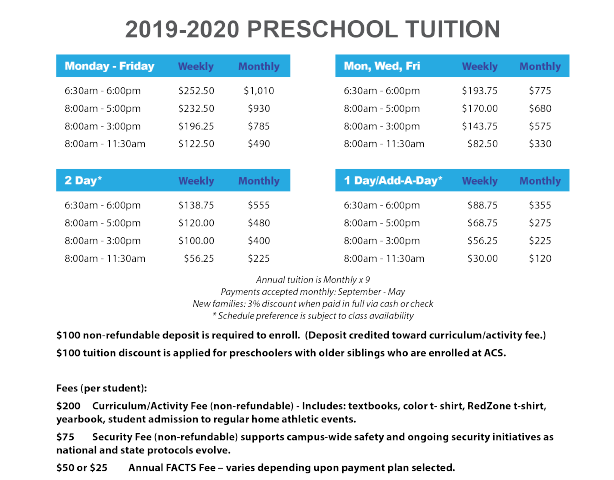 There is an annual Curriculum/Activity Fee of $200, an annual Security Fee of $75, and a FACTS fee based on your payment plan. Parent orientation occurs in the end of summer at our annual ACS Block Party and is required for all parents. It is important that parents read and understand the Parent/Student Handbook. StudentID pictures should be taken and other important forms should be completed at the Block Party.